Spencer Niles is a participant in the NCAA Lawsuit. He is a member of the PS4RS Board and is a Penn State alumnus earning his doctoral degree from the College of Education in 1986. He served as Distinguished Professor and Department Head for Educational Psychology, Counseling, and Special Education in the College of Education at Penn State from 2000-2013. 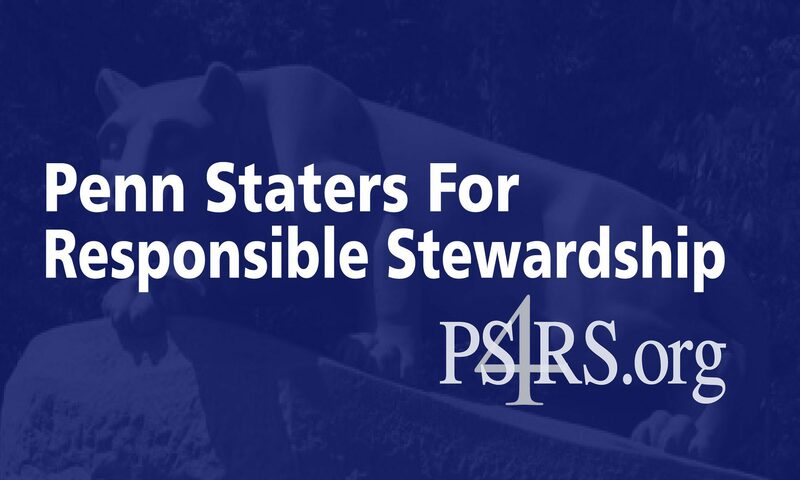 In subtle ways, as in my case, and more blatant ways as in Peter Khoury’s case, those running Penn State remain on a mission to NOT defend our University. Now that the BOT has been successful in their intimidation of Mr. Khoury, they will turn their full attention to attempting to intimidate Messrs. Clemens, Lubrano, McCombie, and Taliaferro with the goal of persuading (i.e., strong arming) them into withdrawing from the lawsuit. When one considers our suit against the NCAA, I’m mystified as to why the BoT (minus the four gentlemen mentioned here) would be so aggressive in seeking to squelch a legal action that is largely focused on basic principles that can be simply boiled down to doing the right thing (e.g., following the rules of law, providing due process to former administrators who are innocent until proven guilty and challenging whether the NCAA followed its own processes and policies when it applied unprecedented sanctions to Penn State and made false allegations about our “culture”). So rather than rising to support our efforts to defend Penn State (or just allowing our difference in opinion about the lawsuit to coexist), the BoT continues its fight to silence those of us who are seeking the truth so that what occurred here truly will never happen again. “Apologize and move on” has morphed into “make any efforts to challenge the NCAA and we will do whatever we can to silence you.” I’m not sure that many within the Penn State community understand how devastating that stance is to a university. When differing viewpoints are not allowed, when good people are punished and threatened for voicing their opinions and seeking the truth, then the primary mission of a university becomes distorted into something less than what it should be. The part of Penn State’s mission that suggests, “our educational programs are enriched by the cutting edge knowledge, diversity, and creativity of our faculty, students, and staff” becomes weakened when the reality is that the rest of that statement should read, “as long as you agree with the Board of Trustees.” There is a reason why the logo of Harvard University contains only one word- VERITAS (truth). Great things happen when that virtue is supported and when a university behaves accordingly. To be sure, seeking the truth can be messy, even painful at times. There is, however, no easy road to greatness. We will disagree at times and we will become frustrated and even angry on occasion- and it is fair for those who disagree with our lawsuit to voice that opinion. However, it is offensive and dishonorable for those in leadership to take actions that seek to silence differing voices. It casts a pall over everything good about a university. It dishonors the excellent work that our alumni, faculty, students, and staff perform everyday. It moves our university away from excellence and toward a muted organization that only seeks the truth when it is convenient to do so. It communicates the message that we “can’t handle the truth.” That sort of leadership results in our becoming less than we are called to be. Well, I (and I am not alone) can handle the truth. What I can’t handle are intolerant leaders who seek to silence the voices of people who disagree with them and then resort to threats and intimidation against those people. Those are not behaviors leading to greatness. They are behaviors rooted in fear. My question to those BoT members who are against our lawsuit is: What are you afraid of? Couldn’t agree more! Thank you Dr. Niles. Thank you, Dr. Niles. Please don’t give in to them. Your last question asking them what they are afraid of really says it all! In my opionion the current BOT. is simply trying to “justify” theis previous inept actions and total lack of honor, Caracter and Leadership. RS4ever keep their feet to the fire and appreciate your efforts! Joe Harteis ’76. I am sure JoPa would agree!